The start of the 60_minutes series was a calm one. 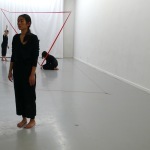 Akemi Nagao, standing motionless on stage, brings the entering audience into stillness. Unrequestet, people take their shoes off to muffle the sound of their steps. This way to begin the show is not surprising yet. The nice surprise is however, that this time it is not just a teaser, not a stillness which is established just to be soon broken. It is a real prologue: it contains already the mood and the timing of the whole composition, which explores the phanomenon of the line. There is no reason to hurry while dealing with the infinity. Long phases of stillnes, slow changes of spatial constellations, and almost a complete silence will remain dominant characteristics of the performance. Some more sudden movements or changes are embed into the calm and sustained frame. 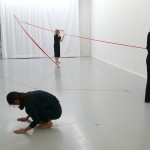 At the beginning the two moving bodies (Akemi Nagao and Elma Riza) seem to relate to some invisible structures. 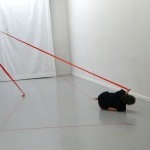 The action of the visual artist Aurélie Pertusot, brings the revelation: she stretches some red threades and ribbons across the space, she reveals some diagonals of invisible volumes, sketches a minimalistic landscape of curve diagramms. 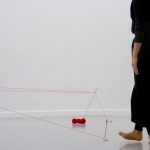 The quality of her movement – pedestrian, expedient, matter-of-factly – is contrasting the physical performance of the movers, who are exploring their body shapes and shape changes in relation to the changing geometrical setting. 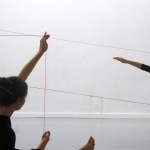 The meeting between visual arts and physical performance is an insightful one. 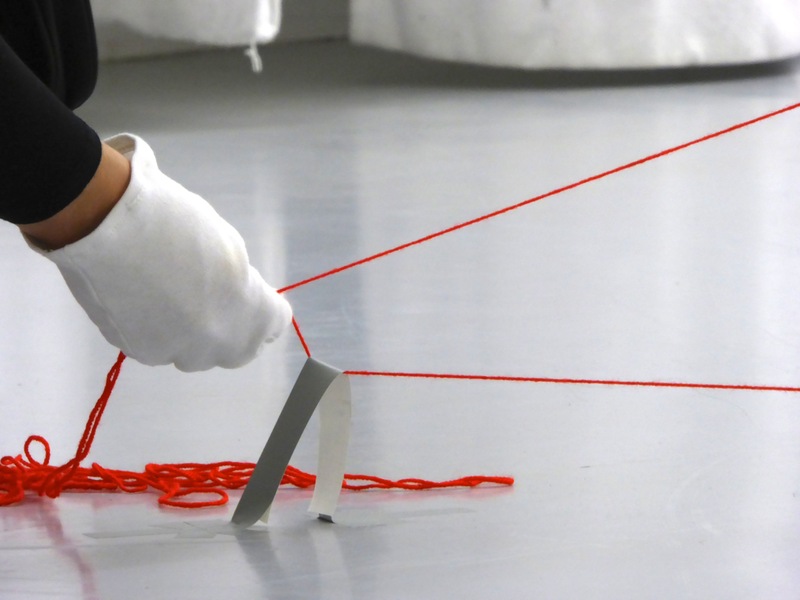 Some key features of the project are adopted from the visual arts: like the endurance while crafting and displaying still forms and shapes, or like naturally granting the artist the authority of the demiurgic gesture. Or like allowing the simple beauty of geometric patterns.